Mineral cosmetics is fast becoming very popular and the majority of you have or do want to try mineral make-up. Well there are few mineral cosmetic companies, one of which Mineralissima. If you haven't heard of this particular brand then head over to their site for more information. They are a company based in the Netherlands and offer an online website. With every purchase they pop in a sample which is a great way of trying out other products which you would't neccessarily buy. I was lucky enough to be sent a few samples from across their range to review. I was sent 2 samples of their foundation, 1.2 (Neutral Light) & 2.0 ( Medium Light) 1.2 is a bit on the paler side for me so 2.0 was a suitable shade and looked fine on. I will probably use the 1.2 as a concealer or a base. Then I had 2 concealers one of which I'm very excited to try on my dark circles and that is the Bisquit concealer tis more of a yellowy shade and think it should counteract with my dark circles hopefully! 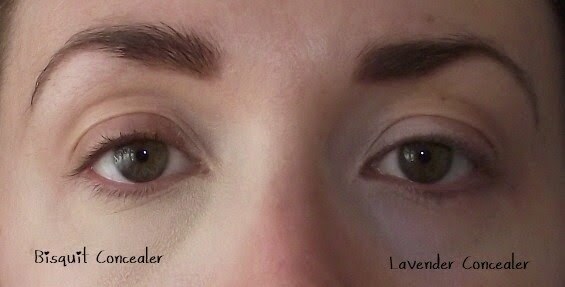 The other concealer is the Lavender Concealer which as you can see from the swatch this is very light. Here is a pic of both correction concealers on.. for me personally the Bisquit Concealer is better suited for my dark circles. I then applied the mineral foundation 2.0 all over which i don't normally do after using concealer but thought it was good to try it the other way round. What do you do first? This is a first for me a Mineral Primer which is suitable for all over the face but perfect for the eye area. I have to say it was a little tricky using it at first, partly down to the powder formulation. It's a little more on the thicker/crumbly side. However I soon found the best way to apply so we soon got on! The best way I found was using a flatter eye brush and packing the primer onto the eye lid and then buff into the skin. Next I applied Sheer Gold Highlighter under the brow, this is such a pretty soft colour perfect for day use. The first eyeshadow I used was Angel all over the lid and blended up into the crease. I was so excited to be adventurous and try Lola. I applied Lola in the outer corner and all through the crease of the eye blending lighter towards the inner eye. I then blended Emerald in the outer corner and a little into the crease creating a soft flush of colour, and then really packed Emerald on the eye lid itself. This is a beautiful shimmery green which has gold undertones. For eyeliner I mixed up a little Lola and a couple drops of water into one of the sample pot lids. I was really impressed with the strong vibrant colour you can create. Check out the swatches! I also experimented by adding a little of the sheer Gold Highlighter. Have you ever tried making eyeliners from your mineral eyeshadows? I applied the eyeliner on the upper lashes and under the lower lashes, I really enjoyed sampling these mineral eyeshadows. You can create so many different looks very easily, they blend so well together. I hope you can see the gorgeous finishes on the swatches. What do you think? Pretty or what? Then for cheeks I used Blush Blush and a little sheer gold highlighter on the cheek bones. This is such a nice pretty look for the day and with all the shimmer it really doesn't look caked on. Mineralissima has such gorgeous pretty powders there truly is something for everyone. Yesterday I used Angel over the lid and crease and then blended Whisper just in the outer corner with a little Lola. I used my new lovely Metallic Gold Khol from No7 in the inner corners of the eye. On the face I used the mineral foundation 2.0 aswell as sneaky blush and Amber lipgloss. I really like this look, Lolo blended into the crease ontop of Whisper creates a lovely grey/taupe colour. The Lipgloss is the colour Amber and is so cute, it's a mini size and perfect for your pocket or purse. However for me the smell is a little off putting, the lipglosses contain Peppermint-Oil which I did already knew and was interested to try one out. Well if you like the taste of green tea then you'll be fine but if you don't then probably best not try. It`s a shame because the colour is beautiful and contains enough colour to be worn alone or for that added sparkle ontop of a lipstick looks fab aswell. love the swatches. the first look is very pretty! Hiya, love the second look - so pretty. Since all brands dnt suit me, I want samples too so that I can knw if they'd suit me.. How do I get them?! I stay in India..shall be grateful if u lemme knw where can I get mine from! Thnx.. Lovely blog!